The heaviest lion on record weighed an amazing 375 kg (826 lb). Lions can reach speeds of up to 81 kph (50 mph) but only in short bursts because of a lack of stamina. Lions mostly eat large animals, such as zebra and wildebeest. They also steal from other predators such as hyenas and leopards. Females are the primary hunters in a pride. Female lions mate about every two years, giving birth to one to six cubs after a three-and-half-month gestation period. About 60 to 70 percent of cubs die within the first year of their life. Females cooperate in raising a pride's cubs. In the wild, male lions live about 12 years, while females live about 15. Zoo lions can live longer, into their 20s. Asiatic lions have skimpier manes than their African cousins and have a characteristic skin fold on their belly, according to the WWF. An African lions' ears are always hidden by its mane, while an Asiatic lions ears are visible. Female lions will copulate on average 3,000 times for each cub that survives for a year. Prides can have as many as 40 individuals, including adult females, sub-adults (about 2 to 4 years old), cubs and one or two attached male lions. Females stay in their mother's prides their entire lives, unless food shortage forces the pride to fracture. Males, however, are forced out of their pride when they are old enough to compete with the dominant males. Male lions will roam in groups, usually made up of related individuals, and search for prides to take over. Males typically only live in a pride for two to three years before being forced out by another group. Male and female lions mark their territory with urine and by roaring. 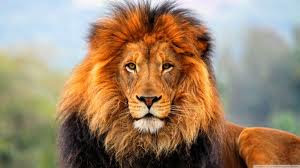 Lions are the national animal of Albania, Belgium, Bulgaria, England, Ethiopia, Luxembourg, the Netherlands and Singapore.